If you’ve played PUBG, you’ve probably experienced server lag at least once. I mean, as good as it is, it’s still an Early Access game. Sometimes you land before the textures have loaded, even if you jump late. Would you rather tackle your problems more discretely? Check out our list of the best stealth games. 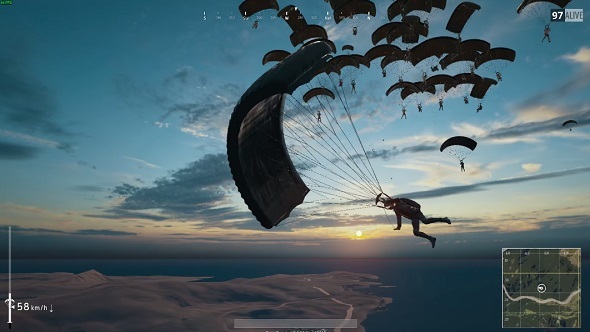 If you don’t know PUBG, each match starts with a flyover of the map – 100 players sit inside the plane and they jump out when they wish, parachuting across the map. The game eventually forces them all together with a wall of electric smoke, but there’s usually much fewer players left by this point. In one recent game, things didn’t play out this way, however. Server lag kept everyone seated until the plane had finished its flight across the map. As you’ll know if you’ve ever sat on until the end, the game eventually kicks you out. In this case, it did – all 100 players, many of whom were still frozen. Because they were frozen for the parachute segment, they mostly went straight down, leaving the entire server unarmed and stood together in a field. Check out the video above to see the punch-up that followed.